Our scriptures today are filled with people trying to move their pumpkins alone, filled with people who had forgotten to ask God to help. In our first reading, we see Jeremiah addressing a group of folks who had forgotten how God had saved their ancestors from slavery in Egypt. They had forgotten God in the midst of their tears, their afflictions, their burdens—most of which stemmed from the fact that Jerusalem fell during the course of Jeremiah’s ministry and was destroyed. After the fall of Jerusalem, the Babylonians allowed Jeremiah to stay in his destroyed, desecrated homeland while many of his fellow countrymen were taken into captivity for 70 years. Our first reading reminds us that when all seems lost, all seem destroyed, our God can help to fix things. He can help us to lift our pumpkins. He has the strength to do it. And he does it. In our second reading, we are reminded that Jesus is the High Priest who offers the ultimate sacrifice—himself. Sometimes we are tempted to think we have to sacrifice our way to heaven, to earn it. 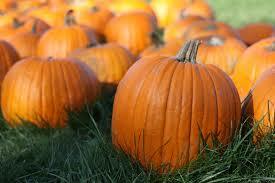 Sacrifice is a part of our discipleship, but we can never move enough pumpkins on our own to get to heaven. We need God’s help. In our Gospel, we see Bartimaeus, a blind man. He had tried to lift his own pumpkin for years. I’m sure he went to all the doctors. He probably tried all the potions in town. He sought to do all the penances, as he thought it was a punishment from God. But then he finally breaks down and asks Jesus to help him to see–only after Jesus asked him what he could do for him! He finally asks for sight…and look what happened. Jesus makes him to see. Maybe it’s something to do with stress or loss. Maybe you feel you’ve got the weight of the world on your shoulders, and another feather would take you down. Maybe you have some horrible health problem like Bartimaeus. Maybe you’re dealing with some guilt, addiction, suffering, failure, loss, etc. We’ve all got our pumpkins. It’s tempting to think we can lift them alone, that we’re all doing just fine, thank you very much. But we need God’s help. God sees us trying to lift these pumpkins alone, and he offers us all the strength we need–through family and friends, eucharist and confession, scriptures and prayers, and a whole host of a thousand million things. I can do anything with Christ who gives me strength.